The fitness-focused smartwatch can't run apps like the Apple Watch or Samsung's Gear S2, but wins when it comes to fitness and battery life. 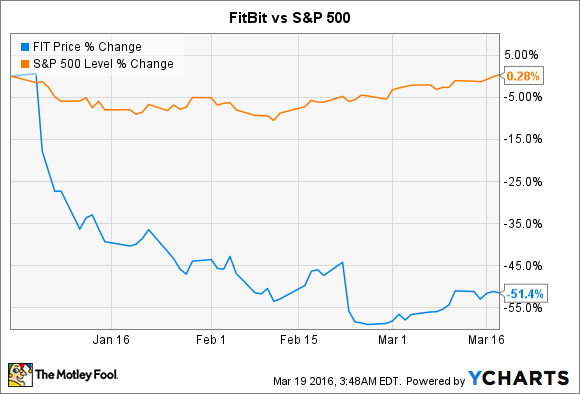 When it comes to wearables, no company sells more than FitBit (NYSE:FIT). The fitness tracking giant shipped 8.1 million wearable devices in the fourth quarter last year, according to research firm IDC, almost twice as many as its closest competitor, Apple (NASDAQ:AAPL). That's crucial, because FitBit, as a hardware company, derives virtually all of its revenue from the sale of its trackers, which are typically worn on the wrist. The emergence of the smartwatch -- led by Apple, and its longtime rival Samsung (NASDAQOTH:SSNLF) -- poses an existential threat. As smartwatches become more capable, adding additional fitness features and gaining in popularity, the market for FitBit's trackers could recede, or even vanish in the years ahead. That's what makes the FitBit Blaze so important. The first smartwatch from the company went on sale earlier this month. Although critical consensus may not adequately reflect future demand, investors should take solace in initial impressions, which have been generally favorable -- far more favorable than the market's. 2016 has been a tough year for FitBit shareholders. Year-to-date, shares of FitBit have fallen more than 50% after a steady stream of poor reports cast doubt on the company's ability to succeed. In January, FitBit faced a class action lawsuit; in February, it turned in disappointing guidance. Along the way, analysts added to the slide, cutting their price targets and reducing their ratings. But the selling began in earnest during the first week of the year when, at CES, FitBit unveiled the Blaze, its smartwatch. Unfortunately for shareholders, investors were not impressed, and FitBit slid more than 12% in a single day. Perhaps the market was reacting to the Blaze's looks (it isn't the most attractive device) or its features (nothing revolutionary). At any rate, confidence in FitBit's latest product just wasn't there -- few appeared to believe the Blaze was the device the company needed to beat back Apple and Samsung. But with the device finally hitting retailers, it's worth asking if the market made a mistake. Reviews of the FitBit Blaze have generally been favorable, although it would be wrong to characterize them as overwhelmingly positive. The Verge's Chris Welch awarded the FitBit Blaze a 7.2 (out of 10), praising the device's long-lasting battery and modest heft, but taking issue with the watch's design and limited notifications. "[The FitBit Blaze] strives for much, much more, with a watch-like design and color display. Unfortunately, the result is arguably an uglier FitBit," he wrote. The Wall Street Journal's Joanna Stern came to a similar conclusion. "The thick bezel makes it awkwardly wide, especially on my small wrist...Too many times this week I looked down and thought: When did I strap an iPod Nano to my wrist?" she wrote. Still, she noted that, away from its charger, the FitBit Blaze lasted far longer than the Apple Watch, and offered much more impressive fitness tracking features. ZDnet's Matthew Miller was far more positive, awarding it a "spectacular" rating of 9.6. Miller enjoyed the helpful workout guides, and accurate heart rate monitor. "...it has been a real pleasure to wear it 24/7 during my testing period," he wrote. Notably, he disagreed with Welch and Stern when it came to the device's aesthetics, arguing that its "modern, techy look" was both stylish and attractive. Since its debut, the FitBit Blaze has climbed to the top of Amazon's sales charts, and is currently the best-selling item in the SmartWatches category -- a category that notably includes both the Apple Watch and Samsung's Gear S2. Yet some may view that as a mischaracterization, because the FitBit Blaze does not stack up to its smartwatch competitors. Where the Apple Watch and Gear S2 allow their owners to install and access third-party apps, the Blaze is restricted to FitBit's own proprietary software. That gives it some notable advantages (cross-platform compatibility, intuitive interface), but leaves it incapable of matching its rivals in terms of sheer functionality. Still, the FitBit Blaze is most definitely a watch, rather than a tracking band, and that puts it in direct competition with the Apple Watch and Gear S2. It may be unlikely, but it's not inconceivable to imagine someone using both an Apple Watch and one of FitBit's smaller, cheaper bands (say the Flex) in conjunction. With the Blaze, that possibility is practically nil (those with eccentric fashion tastes notwithstanding). In its annual filing, FitBit notes that the Blaze helps it target a different group of users. Currently, the majority of its buyers are of the casual, "everyday" variety. The Blaze is aimed at the more active, those who engage in regular exercise and recreational sports. From a functional standpoint, the Blaze is almost indistinguishable from FitBit's Charge HR, just in a different form factor and augmented with a touch screen. That approach has helped FitBit sell more wearable devices than anyone else, although its rivals are slowly catching up. Apple shipped 4.1 million Apple Watches in the fourth quarter, up from nothing in the prior year. Samsung saw its quarterly shipments rise 65% on an annual basis -- better than FitBit's 52.8% growth. The Blaze isn't the revolution some investors may have hoped for, but it's not a disaster either. If you believe FitBit's core mission has merit -- offering relatively simplistic wearable devices focused primarily on fitness -- then the Blaze should be seen as a triumph rather than a failure.